Lesotho’s HIV incidence has decreased by almost 50 percent in the last few years, the Ameri­ca-based Aids Ambassador Deb­orah L Birx revealed this week. A world renowned medical expert and leader on HIV/Aids issues, Dr Birx is the coordina­tor of the United States Govern­ment Activities to Combat HIV/ AIDS and Special Representa­tive for Global Health Diploma­cy. Speaking during a teleconfer­ence interaction with journal­ists in the African continent on Tuesday, Birx observed Lesotho was making positive strides against the pandemic. The meeting was organised to commemorate 15 years of the US President’s Emergency Plan for Aids Relief (PEPFAR) in Af­rica. The US government’s initia­tive is designed to address the global epidemic and save lives of people infected and affected by the disease, primarily in Af­rica. “If you look at Lesotho’s num­bers, your incidence has de­creased by almost 50 percent just in the last few years. That is remarkable, that is what we need to do (fighting HIV/Aids), and that is why we have been very persistent about maintain­ing the pressure,” the ambassa­dor said. Lesotho has the second high­est HIV/Aids prevalence of around 25% after eSwatini. However, a remarkable prog­ress was first realised in the Lesotho Population-based HIV Impact Assessment (LePHIA) national survey conducted from November 2016 to May 2017 in order to measure the reach and impact of the country’s HIV prevention, care and treatment services. Some of the key findings by LePHIA were that the preva­lence stood at 25.6%, with 30.4 % among females and 20.8 % on males, corresponding to an estimated 306 000 population living with HIV/Aids. The survey added 1.47 % was the annual incidence, with 1.74 % among females and 1.22 %. The viral load suppression among all HIV-positive adults was reported at 67.6 %. 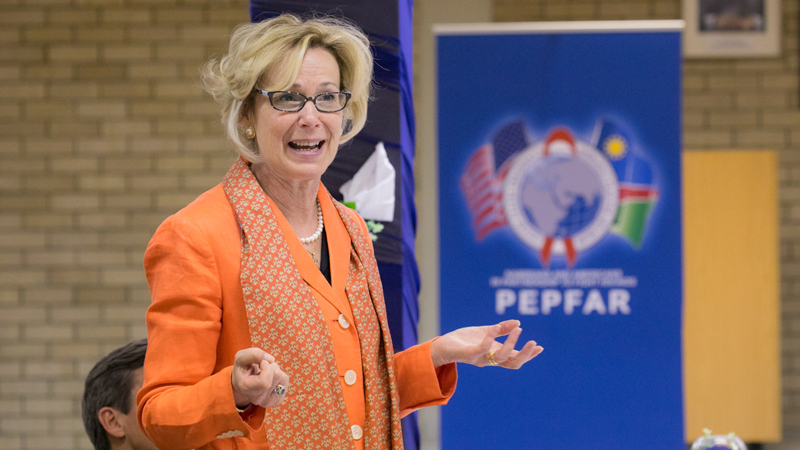 Ambassador Birx noted eSwa­tini, Namibia, Botswana and Malawi were also making pos­itive strides, while she added the pandemic remained quite a burden for other countries such as South Africa. “There are other countries where it is known that the burden of HIV disease is quite large, like South Africa, where we’re working together to ac­tually realize the President’s vision of getting two million additional South Africans on treatment in the next two years. That is what it will take to really decrease what we call the community viral load – the transmission at the community level,” she said. The Ambassador pointed out PEPFAR had asked all sub-Sa­haran countries in Africa to embark on a self-testing pro­gramme. “Why? Because the commu­nity-level surveys conducted in Sub-Saharan countries, al­though we found huge impact among women because women have access to treatment and diagnosis when they become pregnant, if you look at men, we were finding men very late. We were only finding men when they presented as inpa­tients or outpatients with TB or opportunistic infections, because they didn’t see them­selves during the time of the six to seven years where you’re well with HIV; they didn’t really see the immune destruction that was occurring, and so didn’t come to the clinic,” she said. The American government has, through PEPFAR, spent over M4 billion in the last ten years.